European Roulette by Betsoft is a game based on… well, the European version of the roulette game, as can be guessed by the name. The European and the American versions of roulette are basically the same things with one important difference: European version has only one “0” at the wheel. (The “00” section is invented by the US casinos to lower the chance of winning.) In other words, your winning odds look good! The graphical quality of the game is nice; don’t expect so much of course, it is basically a static image of a roulette table, but it looks good and realistic. To the upper left, there is the wheel and at the bottom right, the bet section. You can bet on a lot of things in the game: a single number, a range of numbers, colors (red or black) or whether the number is odd or even. Each one pays a different cash prize of course, betting on a single numbers pays the most. To start the game, you need to set your bet amount first. You can do that by clicking on to the poker chips which are located at the bottom right. You can bet between 0.25, 1.00, 5.00, 25.00, 100 and 500 coins per spin. After that, you need to click on the bet area of your choice at the table. For example, to bet on red 12, simply click the section with the same symbol. Now, we can click on the “spin” button and start the game. To the upper right side of the screen, you can see the wheel from up close; next to that, there is a table that shows all of the bets played so far. If you win, you get the prize of your bet. If you lose, you can try the same bet again by pressing the “repeat” button or start a completely new game by clicking on the “clear” button. In the demo version, you have 1.000 complimentary coins. You are also limited to a maximum of 100 coins per spin in the demo mode, if you want to play with 500 coins, you must play with real money. 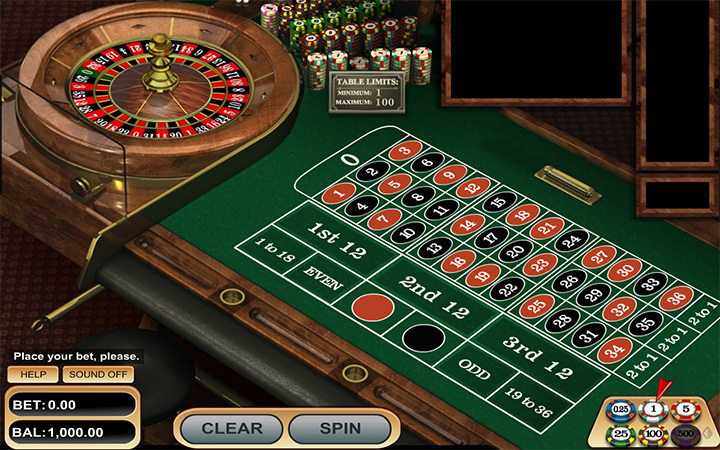 European Roulette is a simple yet entertaining game if you are a fan of free roulette games. It is also suited for beginners too. Enjoy the game and play at Casino Avenue to find more roulette games like this!